According to the August edition of Jump SQ this year, which will be released on July 4, 2016, Ao no Exorcist (Blue Exorcist) will be getting a sequel anime scheduled to air in 2017. It will adapt the Impure King arc from the manga. The official website has recently displayed a countdown timer that is still running. The timer is scheduled to end on July 4. The series previously received a first season anime adaptation in 2011 and a movie anime adaptation in 2012. It was announced that the cast members from the first season will be reprised, while the staff members for director and series composition will be changed. Well Noragami Aragoto did a similar deal with a second season being released where the filler ending of the first season was simply ignored and the show went back on track following the manga. It makes sense and seems to be a thing now which I definitely approve of. Whats with older shounen being brought back to life. D Gray man too. D.Gray isn't and never was shounen. Haven't watched the first season but heard mixed things about it; mainly that it wasn't faithful to the manga. Will S2 be any different? Not sure if it's worth watching. You can easily watch it up to Episode 15, this is where it stays pretty close to the source, so-called "anime-original content" (i.e. bad part) starts with Ep. 16. 0n topic: I have a mixed feelings about it. I liked the 1st half and immediately recognized when they started "original content" even prior to reading manga. But anime-original put the end to the story. So I'm partly glad, partly scared, because I can't imagine how it can even be a sequel. Hope they really just ignore the anime-original content and continue like the 2nd half never happened. I am thinking of catching up to this and AOT so that they when they come out, they Will be the first shows I watch as they come out if so. He's a demon, isn't he? I can't wait for season 2! 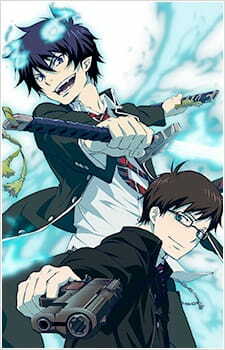 Ao no Exorcist was my very first anime, and I really love it! I had read the manga vol 1 and it's awesome. Gonna buy vol. 2 soon. So yeah, hopefully it is gonna be great! Didn't really liked the anime adaptation in the first place so I'll be sticking with the manga. Honestly FMA '03 was more faithful to the manga. Didnt rush and cut content, and no added shounen gimmicks during serious moments. Finally after 5 years, it's time for a comeback! Finally retconning the anime original bs. I thought that ending had sunk any chance of an anime reboot, glad that's not the case. However, I'm wondering what they're going to do about the anime original ending and the movie or if they're just going to retcon it without even telling us it's retconned. I'm thinking they'll probably do the latter as there would really be no possible way to fit that into the manga continuity without looking completely idiotic. I am awaiting for the new seasone to start. c.c * hyper mode on * lookin' forward to see it in HorribleSubs. After that butchered ending? Wonder how this will turn out. Yeah, one of my favorite manga, the first half of season 1 was brilliant, the second half was trash, I don't even know why ruining anime by adding fillers ? Just stick to the original material please. When I saw this, I seriously freaked. Blue Exorcist is one of my favorite animes and I loved the first and second openings and the first and second endings. I am SO HAPPY to see that there will be a second season! I was seriously in love with Rin when I first saw it (and I mean it, with heart going dokidoki when I was about to sleep after watching some episodes and all that) so I'll gladly return to his world one more time. Can't wait!